Alberto first came to MCC Peace and Joy in Nicaragua in 2000. In the years that followed his participation was marked with great passion and commitment: as he was ordained a deacon in 2002; later appointed as interim pastoral leader; and in 2006, after an intensive process of theological studies, training, accreditation, recognition of studies completed, and under the leadership of Rev. Elder Darlene Garner, he was ordained as clergy in UFMCC. At that time, Rev. Nájera continued to serve as pastor of MCC Peace and Joy in Managua, Nicaragua and Founder of three groups ICM Mission in Chiriquí, Colón, and Panama City in Panama. Alberto is also a journalist who has worked professionally in radio, television, magazine publishing, and public relations; other previous work includes experience with various NGO’s in both Nicaragua and Panama where Rev. Nájera provided leadership and developed programs in the education and prevention of HIV/AIDS. As an important part of this work, he coordinated the “Peace and Joy” Social Action Program – a partnership between the MCC church in Nicaragua and various community organizations to provide education, communication, prevention programs, pastoral and spiritual support to families and people living with HIV/AIDS. In the United States, his professional focus includes teaching in public school and working with The LGBT Life Center of Hampton Roads, VA as a community health worker and medical case manager in the areas of HIV/AIDS prevention and care. Since 2013 Rev. Nájera has served as staff clergy for Latino and Community Outreach at New Life MCC of Hampton Roads, VA. In this role, Rev. 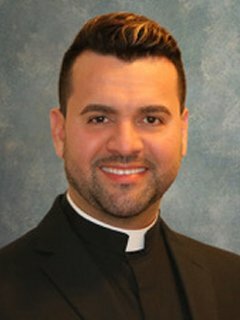 Nájera began and leads the church’s Spanish Language worship, taught Spanish classes for the church and community, and has helped to coordinate both church and community involvement for marriage equality and various other human rights issues both in Hampton Roads and in Richmond, VA. In addition, Rev. Nájera has provided support to the Unidos Latino ministry of MCC Washington, DC. and has served on the international judicial pool of MCC since 2012. Through the years, both in Nicaragua and after coming to the United States, Alberto has remained close to his family. With his parents and three older siblings his early years were spent on a rustic mountain cattle ranch where Alberto developed a lifelong love for riding and horses. Today, he lives in Virginia Beach, VA with his husband, Rev. Mark Byrd and their yellow lab, Nica. He is an excellent listener with the courage to speak up. He is respectful of others, effective in uncovering and addressing dysfunctional systems and behavior, and successful in conflict management and resolution. He has a good sense of humor, a hearty laugh, a spirit of joyfulness, and a willingness to admit shortcomings and weaknesses. This is Rev. Kenny, a Beloved Child of God who values serving within a Church that welcomes inclusion, serves those on the margins and affirms ALL people as God’s Beloved … just the way we are! Rev. Kenny currently serves as the pastor of MCC Richmond, where he has successfully helped the congregation transition to a thriving, growing, mission-focused church. He was ordained in the Evangelical Lutheran Church of America in 2000 and has served six congregations in a variety of ministry settings and positions. He transferred his ministerial credentials to UFMCC in 2016. When Rev. Kenny first arrived in Richmond, the church was in financial distress. With waning attendance and questions about accounting practices, MCC Richmond did not inspire giving. Yet through encouragement and a more transparent financial system and team, Rev. Kenny was able to gain the congregation’s trust, which has resulted in a balanced budget and a year-end surplus! With extensive training from the Alban Institute at Duke Divinity School in conflict management, leadership and staff development, Rev. Kenny knows that a team approach to church leadership and the proper training are what empower and encourage leaders. He also believes in leading by example and strives to model constructive leadership behaviors. Once hindered by systems and behaviors that prevented it from living up to its full vision of Sharing God’s Love with All People, MCC Richmond today makes a daily impact on Greater Richmond. Under Rev. Kenny’s leadership, the food pantry has doubled its hours, the church fellowship hall is now open during pantry hours to allow participants a safe place to sit and have lunch, the church hosts a variety of support and recovery groups, and attendance at the mid-week dinner church has more than quadrupled. The church also collaborates with several community partners, including the Richmond Police Department, which has chosen MCC Richmond twice for its Citizens Police Academy and often calls upon the congregation to be a safe place during community activism events. Rev. Kenny was central to this process and has helped the church gain the respect of many community leaders and organizations, some of which contribute financially to the congregation’s ministry outreach efforts. Rev. Kenny is honored to be selected and enthusiastic about serving on the Governing Board of UFMCC. If elected, his core competencies include an infectious faith and love of God, love and dedication to the movement and collective ministry work of UFMCC, integrity, and compassionate yet assertive leadership. Rev. Marie Alford-Harkey (she, her, hers) is the president and CEO of the Religious Institute, a national multifaith nonprofit dedicated to advocating for sexual, gender, and reproductive health, education, and justice in faith communities and society. Religious Institute programs address reproductive health, rights and justice, full inclusion of LGBTQ people in faith communities and society, comprehensive sexuality education, and prevention of sexual abuse, harassment, and misconduct in faith communities. Marie holds a Master’s in Divinity from the Episcopal Divinity School in Cambridge, Massachusetts. As president of the Religious Institute, Marie puts her faith to work alongside her passion for justice. She is a skilled communicator and relationship-builder, and delights in collaborating across faith traditions, justice movements, and all kinds of difference. 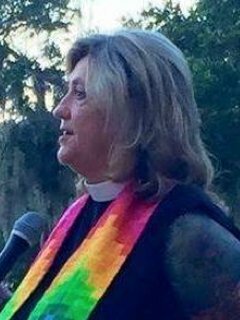 Marie has a chapter on “Sexual Justice in an Age of Trump” in the 2017 book Faith and Resistance in the Age of Trump and is the lead author of the Religious Institute publication Making the Invisible Visible: Bisexuality in Faith Communities. Marie speaks, teaches, and preaches regularly on faith and sexuality. 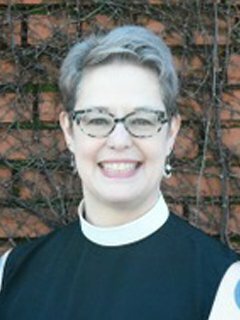 Marie serves as volunteer assisting clergy at MCC Hartford, Connecticut, USA, and also served as sabbatical pastor there for two months this year. In her previous life, Marie taught high school French and Spanish for 20 years. Marie and her wife April (they met at Episcopal Divinity School), an Episcopal deacon, live in Milford, CT with their cat Memphis and April’s ministry dog, Sandy. Rev. Paul Whiting, originally from Great Britain, has lived in North America since 1995. He has been in leadership with MCC since 1987 working in England, Canada and USA. 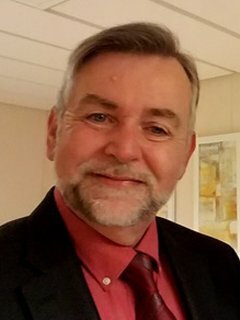 As a Past President of the European Forum for LGBT Christian Groups, and board member for six six years he has worked internationally for much of his adult life. 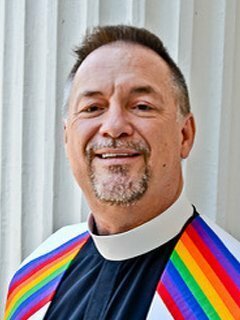 He has also served on the board of Healthy Gay Manchester (now the LGBT Foundation), AARP Kansas Diversity Council, and a variety of boards and committees within MCC. He has moderated local church boards continuously for thirty years, and recently completed two terms of Network Leadership, in Canada and in the central USA. He has recently been appointed as Provisional Pastor of MCC Charlotte, Charlotte NC. In addition to an education in biblical and pastoral theology (Mattersey College, UK), he studied business administration (Birmingham City University, UK) and held a license with the Institute of Administrative Accountants. He has been legally married to his husband Karl since 2007.